A leader in expense management, Atlantis Business Consulting is known for its expertise in helping businesses reduce costs associated with energy. The firm serves companies in New York, New Jersey, Connecticut, Pennsylvania, Illinois, and Massachusetts. Currently, Atlantis Business Consulting is working on developing a solar power plant in New Jersey, scheduled to open in 2012. Solar power, which describes the energy that is obtained by conversion of sunlight into electricity, has become a more attractive energy source in recent years. So what are the advantages of solar power? One major attraction is the fact that it is a renewable source of energy, as sunlight is readily available. Unlike solar energy, other sources of energy can be depleted. Another advantage of solar power is the fact that it does not cause pollution. And, unlike oil, sunlight does not cause harm to ecosystems as the process of generating solar power does not involve any spills. Furthermore, solar energy is free after the initial installation of equipment. Individuals living in rural areas might be drawn to solar energy since it may be more accessible to them, compared to some of the conventional sources of energy. Also, the process of converting sunlight into electricity does not create noise pollution, unlike the process involved in extracting oil. Solar panels are easy to install as wires or cords are not involved in the set up. The equipment used to generate solar energy requires little maintenance. Typically, solar cells last a long time, requiring only an annual cleaning. Though solar panels may be expensive, the savings generated on electric bills makes the investment worthwhile. Scientists are working on improving the process of generating solar power, and we believe that it will become increasingly popular as an alternative energy source. Many companies continue to factor additional costs for electricity into their budgets. After all, businesses require the technology to handle operations and administration, and this equipment uses a large amount of electricity. Moreover, everyday expenses such as heating, ventilation, and air conditioning (HVAC) systems consume a great deal of electricity. For some organizations, HVAC equipment accounts for the majority of their electricity costs. While the energy market dictates many of the cost considerations for electricity, deregulated markets offer companies an opportunity to benefit from competitive pricing. Transmission companies generate electricity, but a growing number of companies purchase this commodity at wholesale rates and then sell it to businesses, homeowners, and other individual users. In an effort to gain long-term business, these providers offer a vast array of client services and prices. Businesses tend to be a target audience for electricity providers because most businesses require an inflexible quantity of electric power that increases rather than decreases. As such, businesses of all sizes find themselves in an excellent position to garner electricity contracts that offer considerable opportunities for savings. However, the implementation of energy conservation programs captures additional savings that can provide funding for other purposes. Because of the energy usage and costs of heating, venting, and cooling, HVAC improvements tend to be an easy way to obtain savings. Simple steps, such as cleaning or changing air filters, improve the efficiency of HVAC systems and prolong the life of equipment. A preventative maintenance schedule facilitates optimal effectiveness of such systems, but it also ensures that companies are proactive in dealing with malfunctioning equipment before a failure occurs. A regular maintenance schedule should include cleaning evaporators, condensers, refrigerant coils, and exchanger surfaces. In addition, companies use their HVAC maintenance program to identify any defects to ducts, pipes, and insulation, allowing the company to resolve issues before they cause problems that could impede normal business operations or incur high replacement and repair costs. About Atlantis Business Consulting: A well-known broker of electric services, Atlantis Business Consulting works with companies of all sizes to accomplish cost savings via negotiated contracts with electricity providers. A vital component of deregulated electricity markets in New York, Connecticut, and New Jersey, Atlantis Business Consulting also helps companies with energy savings programs. Atlantis Business Consulting specializes in evaluating business costs and developing alternative solutions to reduce customers’ expenses. 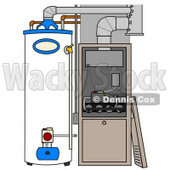 Atlantis Business Consulting provides advice to homeowners on saving energy. For homeowners who wish to employ a whole-house approach to saving energy, checking and replacing insulation is one of the easiest and most cost-effective ways to save. In general, good insulation systems rely on a combination of construction techniques and products that protect the interior temperature of a home from the elements outside, including rolls and batts, loose-fill insulation, and foam-in-place insulation. In the same vein, even the smallest air leak has the potential to counteract heating and cooling systems and drive up utility expenses. In order to prevent air leaks, homeowners should caulk and weatherstrip windows and doors that leak air, install foam gaskets behind wall outlets, identify dirty or damaged spots in insulation, keep the flue damper in the fireplace tightly closed, and install storm windows over single-pane windows. In recent years, manufacturers have developed a host of household appliances that rank well below the minimum federal standards for energy consumption. Since appliances account for some 17 percent of total household energy usage, homeowners should seek out appliances that use as little electricity as possible. In particular, the most efficient products feature the ENERGY STAR label, a federal certification program that indicates a high level of energy efficiency. Aside from installing efficient devices, homeowners can take a number other steps to maximize the performance of their appliances, such as not setting refrigerators and freezers too cold, keeping doors closed at all times, inspecting dryer vents for blockages, and letting dishes air dry whenever possible rather than using a dishwasher. On average, more than 11 percent of a household’s electric bill comes from lighting. In many homes, lighting fixtures are woefully outdated, placing an unnecessary strain on the monthly electric bill. Instead of standard incandescent bulbs, homeowners should use compact fluorescent light bulbs (CFLs) and linear fluorescent tubes, which use less energy and last 6 to 12 times longer. Similar to household appliances, certain CFLs feature the ENERGY STAR label, indicating that they can save up to $30 in electricity costs over the bulb’s lifetime and produce 75 percent less heat. By implementing energy efficient lighting solutions, homeowners can expect to save anywhere between 50 and 75 percent in monthly energy costs. Atlantis Business Consulting works closely with a number of international clients, including Hudson Energy Services, SJ Energy Partners, Con Edison Solutions, and Liberty Power. Atlantic Business Consulting possesses more than 30,000 satisfied customers in the New York Tri-State area.